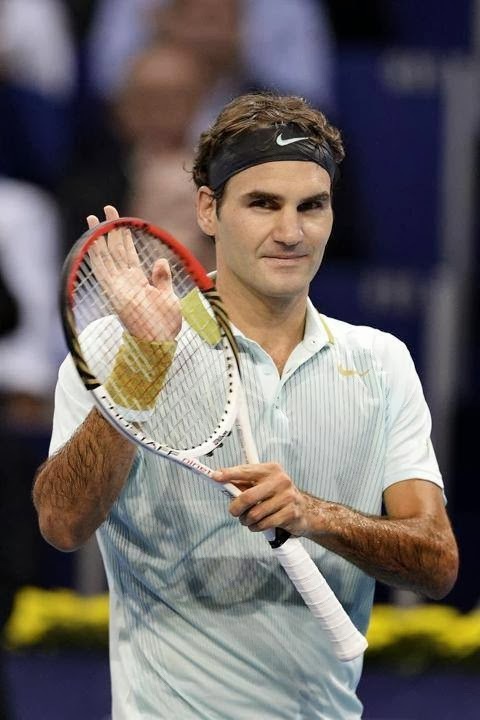 Every Federer fan is watching with much interest this week in Basel. Of course we are all well aware that he hasn't yet booked his place in the coveted World Tour Finals and this week is key in taking some of the pressure off. And we are also watching, as in the last several months, to see when he is going to find the "it factor" in his game once again. Watching his first match against Mannarino it seemed like many of his matches the second half of this year where he had moments of brilliance, but also moments where he made crazy errors and didn't capitalize on break point opportunities. Overall I thought he played pretty well (once I was able to re-watch the match on You Tube, since the original stream I was watching on was terrible! ), but this opponent wasn't a player who had much to threaten him with. We will be able to tell where he's at much more as he moves into the draw playing guys with bigger weapons, such as Denis Istomin, his next opponent. One thing I do know, though, is he is motivated and wants to do well here. Hopefully his hometown crowd will inspire him to find the game he has been lacking for several months now. I found it very interesting to read some of what he has said in the last couple days regarding regretting that he played injured a few times this year. I was at his match in Indian Wells when he injured himself, sitting about 12 rows back from the court, so I was able to clearly see what was happening. It was obvious immediately that he was hurt, but he continued through that match and went on to play a couple more. This also happened in the clay court tournaments he picked up in the summer where his back was hurting but he played anyway. I know a lot of this is due to the amazing guy that he is, not wanting to disappoint his loyal fans who came to see him. Of course we as his fans appreciate this so much about him, but unfortunately as his body continues to age he is going to really have to rethink this in the future, as we have seen the ill effects it has had on him long term. As he said, the injuries caused him to not be able to practice the way he wanted to, which sent him into a negative spiral. Hopefully this will be the week where he can find the right combination of confidence and all that he has been working so hard on in practice and be able to claim his spot at the World Tour Finals and be able to go in with belief that he can compete against the top 8 in the world. Roger Federer - he figured it out! In spite of a setback, we still believe Roger!